You’re currently employed but want to start up a business as a sideline either because you are transitioning from a hobby or you’re keen to supplement your income. Either way, you’re ready to take the leap but haven’t quite got your head around the tax side of things. Am I right? The first thing to establish is whether you are or will be, trading as a business or whether you are earning casual income. We need to look at various tests to confirm whether a business exists or whether your activities can be defined as a “hobby”. You can check here for more detail but essentially, if your activity is something you do on a regular basis, in an organised manner, with the intention of realising a profit, it is a business. If you are “running a business” you will need to decide whether you want to operate as a sole trader or limited company. There are many factors to consider but for the purposes of this blog I have assumed a sole trade structure. If this is you and you haven’t already registered your new business with HMRC, you can do so here. You will need to complete a self-assessment tax return each year. Now, let’s take a look at the tax implications of running your sole trade business alongside employment. What tax do I pay as an employee and as a sole trader? As an employee you will be paying Class 1 NI on your salary. This is deducted through PAYE on your payslip each month. Your employer pays over the tax to HMRC on your behalf. Class 2 NI is a flat rate charge based on the number of weeks you have been operating as a sole trader (£2.80 per week in 2016/17) but if your profits are under the small profits threshold of £5,965 you don’t have to pay this. Note that from April 2018 Class 2 NI will be abolished. Unlike the Class 1 NI deducted from your salary each month, you are assessed on Class 2 and Class 4 NI at the time you complete your self-assessment return. If you have made the maximum contributions by paying Class 1 NI through PAYE on your employment then you will be eligible to pay less Class 4 NI on your sole trade business but you will still have to pay Class 4 NI at the rate of 2% on any profits over the lower limit threshold of £8,060 (2016/17). As an employee your income tax is deducted from your monthly salary as part of the PAYE process. As a sole trader you must pay income tax on your business profits (not turnover) and this is calculated by looking at the TOTAL amount of money earned. When you complete your self-assessment tax return you will need to fill in details on both the employment page and self-employment page. There’s more help here. When calculating what tax rate to apply to your sole trade profits you need to be aware that the tax free Personal Allowance usually gets allocated to your employment income first. This means that tax on your self-employment will be at your own highest tax rate. You earn a salary in your employed role of £35,000 for tax year 2016-17. Assuming no other income, your personal allowance of £11,000 will be set off against your salary income first. The basic rate tax band is £32,000 (2016/17) so £24,000 of salary and £8,000 of sole trader profits will be taxed at the basic rate of 20% whilst the remaining £2,000 of sole trader profit will be taxed at the higher rate of 40%. When it comes to thinking about tax on your income try not to get confused with the “salary” which you earn on your employed position and the money you take out from your sole trade business. As a sole trader, you “are the business” and although you may like to talk about taking a “wage or salary”, this definition is irrelevant for tax purposes. You are taxed on profit before any payments to yourself. 3– When do I pay Income tax and National Insurance? Income tax, Class 2 NI and Class 4 NI on your sole trade profits is payable by 31st January following the end of the tax year. So if you started your business in October 2016 your tax will be due by 31st January 2018. You may also have to make advance tax payments on 31st July if your tax bill for the year (that you completing your self-assessment) is more than £1,000 and less than 80% of this amount has already been deducted at source (tax taken off before you receive the income e.g. salary). You can read more here. Don’t forget to set aside money to pay your tax bill. It’s easy to forget that unlike employment income, tax on your sole trade business isn’t paid over as you earn. If you submitted your tax return online by 30th December and your total tax liability due by 31ts January is less than £3,000, you can opt (via your tax return) to pay tax by having it deducted from your salary via PAYE over the following tax year. There’s more detail here. 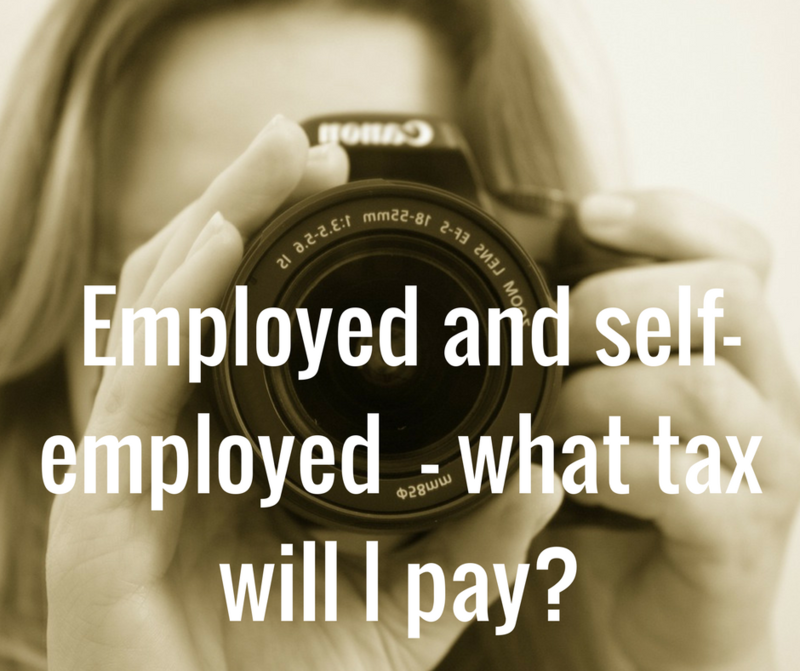 Will my employer need to know that I am also self-employed? Some of you may worry that by registering your business with HMRC, your employer will be notified of your side line business. HMRC won’t forward this information to your employer as your tax affairs are confidential. Have a good look at your employment contract though because it may state that you are not allowed to take on outside work. Will I breach the VAT threshold? The VAT threshold from April 2017 is £85,000 and this means that your turnover (from your sole trade business) must exceed this level before you enter into VAT registration territory. The key thing to note is that you do not have to add your employment income to your sole trade turnover to work out whether you exceed the threshold. You only need to monitor the turnover generated from your sole trade business. In the early stages of setting up your new business? Take a look at my one-to-one program: “Taking the leap into self-employment – what you need to know”. Still feeling baffled by tax matters or just want the peace of mind to know you’re doing the right thing? You may be interested in what’s on offer here. I hope this post has been helpful? I’d love to hear your views and do drop me a line in the box below if you have any questions. Please consider sharing with other small business owners using the buttons below. Thank you.